Today I’m delighted to welcome C. A. Higgins! 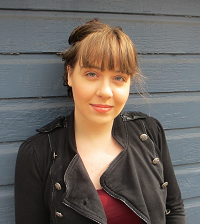 In 2013, her short story “The Changeling” was a runner-up in the Dell Magazines Award for Undergraduate Excellence in Science Fiction and Fantasy Writing. Her debut novel, Lightless, was one of Kirkus‘s Best Fiction Books of 2015, and it was followed by a sequel, Supernova, in 2016. 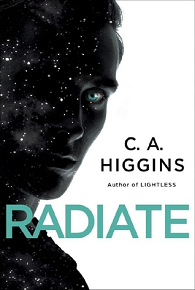 The conclusion to this science fiction trilogy, Radiate, is being released on May 23! I couldn’t blame her for it. I’d decided early on that the leader of a solar-system-wide civil war should be principled but extremist, fanatical, righteous to the point of blindness. If I am unable to admit I’m wrong about the location of the coffee pot even while my roommate is pointing at it, surely a woman leading a revolution wouldn’t consider her own fallibility. 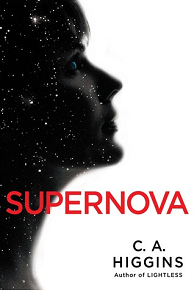 For most of Supernova that worked out fine. Constance’s righteous blindness is the engine behind her revolution. The idea of a heroine who was in many ways inherently unsympathetic interested me, especially as she was influenced primarily by male characters and historical figures: Macbeth, for instance, but not his wife. Walter White. Robespierre. And then came the climactic scene, a confrontation between Constance Harper and one of her rebellious soldiers, a girl named Marisol. It should have been a moment where everything came crashing down, and the reader saw in full what Constance had done and Constance had become—too late to do anything about it, of course. Instead, the scene fell flat. Perhaps, I thought, it was a problem with the structure. One scene after Constance’s confrontation, Supernova’s second plotline reached its climax: a confrontation between Althea Bastet and her AI daughter, Ananke, in a scene deliberately designed to mirror Constance’s clash with Marisol. But that scene worked out fine: the characters did what they were meant to, the emotions and fallout occurred exactly as scheduled. So this whole mess, somehow, was Constance’s stubborn fault. Constance and I circled each other for a while, like a matador and a bull. I’d take a poke at fixing the scene, she’d charge at me bellowing while I scrambled back and left everything as is. I tried going back further—maybe she needed to be motivated more. I added a few more red flags on her path, the universe trying to signal to her that she was sliding down the slippery slope to Hell. “I’m right,” she told me, even while I pointed at the metaphorical coffee pot directly in front of her. “You’re the worst,” I replied, but she didn’t seem to hear me over the sound of her own moral rectitude. I didn’t have trouble with any of the other characters. It was true I had more in common with the others—Althea and I share a certain irritable work ethic, Mattie and I have the same sense of humor, Ivan and I process information similarly. (As for Ida, the nicest thing I can say about myself is that she and I are both ambitious.) Even Ananke, a machine that struggled itself to sentience, was not so difficult to write. Her motivations and vulnerabilities are all inherently human: arrogance, curiosity, loneliness. But a tendency to down coffee and bark at interruptions while working is not enough to understand a character, and it wasn’t as if I understood Mattie because we laugh at the same things. I empathized with these characters, but not because we had superficial things in common. Constance’s problem was not that she was unsympathetic, it was that she was unempathetic. She had flaws, like the other characters, but she did not have any vulnerabilities. I had not wanted Constance to be weak. I had been determined not to give her any traits that might diminish her, or turn her into the supposedly badass chick who becomes helpless in Act Three so that the hero can save her. But a vulnerability does not make a character weak, it makes her real. What would drive the brave leader of the revolution, who had grown up in a world full of terror, except fear? The next time I wrote Constance and Marisol’s confrontation at the climax of Supernova, the scene came through with crashing walls and dawning horror, as Constance realized she had become what she had feared all along. 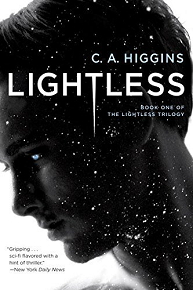 C. A. Higgins is the author of Lightless, Supernova, and Radiate. 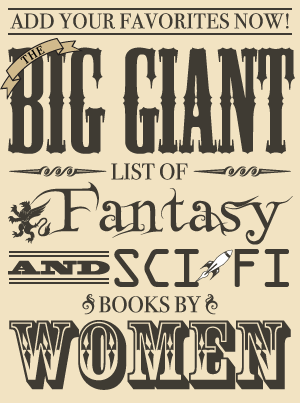 She was a runner up in the 2013 Dell Magazines Award for Undergraduate Excellence in Science Fiction and Fantasy Writing and has a B. A. in physics from Cornell University.